Servicemen in uniform prepare to enter the U.S. Naval and Marine Reserve Center on Wednesday after officials reopened the Riverpark recreation area late Tuesday evening. Plywood still covered a door and window at the U.S. Naval and Marine Reserve Center off Amnicola Highway on Wednesday, and blue tarps still hung over some vehicles in the parking lot. A single Chattanooga police car guarded the entrance to the site, where a gunman smashed through the gate on July 16 and opened fire in an attack that killed five men. Now a shiny silver gate stands in place of the one destroyed in the attack. Five men killed, and five funerals in five days across the United States. The last was buried Tuesday. On Wednesday, men and women in uniform passed through the new gate and under the half-staff American flag, passed by the plywood and the blue tarps and into the red brick building. On Wednesday, Mike Battery returned to work. 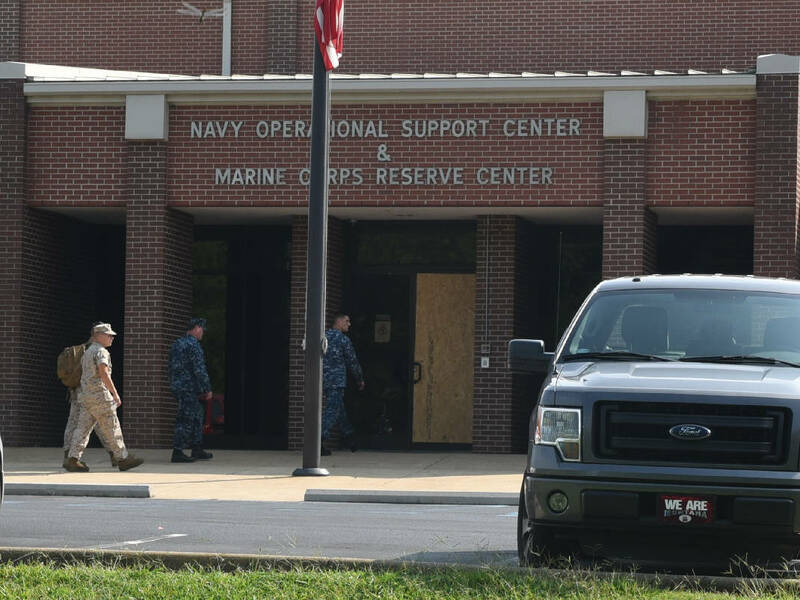 Not everyone in the U.S. Marine unit was there — much of the unit is reserve, only called in a couple of times a year — but the inspector-instructor staff, the folks who are usually there five days a week, returned to their offices for the first time since the attack, said Marine Corps Reserve spokesman Capt. Andrew Chrestman. Federal investigators are still on-site, according the FBI, and a Chattanooga Police Department officer will remain to guard the entrance until the investigators are gone. But besides the officer out front and the sprawling, red, white and blue memorial along Amnicola Highway near the entrance to the Tennessee Riverpark, much on the surface returned to normal Wednesday, almost two weeks after the attack. Two walkers approach the C.B. Robinson Bridge at the Tennessee Riverpark, adjacent to the U.S. Naval and Marine Reserve Center, on Wednesday morning. The public area reopened and usage of the popular spot has resumed as of Tuesday evening at 8 p.m. 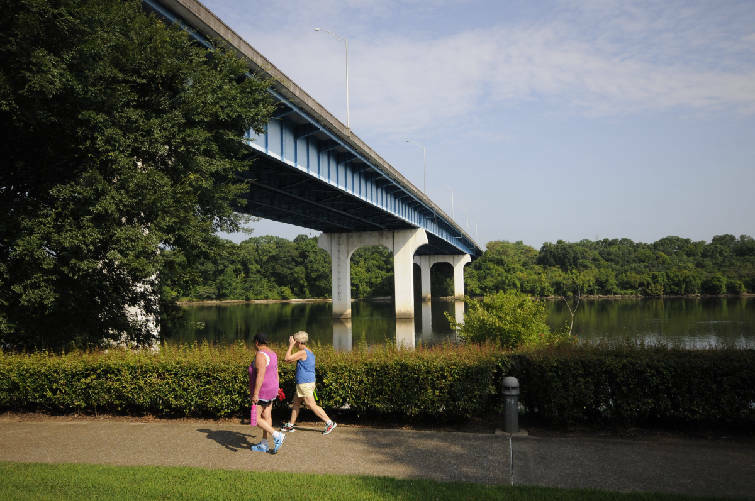 The riverpark — where some Marines who survived the shooting fled and sheltered with civilians in a maintenance complex — reopened around 8 p.m. Tuesday, and was filled with joggers and bikers and fishermen by Wednesday morning. Across town, at the armed forces recruiting center on Lee Highway where 24-year-old Mohammad Youssef Abdulazeez first opened fire, a steady stream of people still strolled past the streetside memorial. Many of the flowers, laid fresh, have wilted. Some balloons are starting to deflate. Wreaths have withered. But for many, the pain is still fresh. "It's still so emotional," said Linda Kring, tears in her eyes as she surveyed the tangle of crosses, flowers, flags, notes and memorabilia for the first time Wednesday. "They were all just kids." The owners of the shopping plaza installed a permanent monument and flagpole Friday, said Keith Wheatley, property manager. It's blank, for now, but eventually will include bronze plaques to honor the men who died. An American flag already hangs on the pole at half-staff. The Vet Center set up a trailer at the memorial to help civilians and veterans alike deal with trauma from the attack. Ronnie Roberts, a readjustment counselor with the Vet Center, said the center saw 2,000 people the week after the shooting. Service men inspect a vehicle at the entrance to the U.S. Naval and Marine Reserve Center Wednesday morning on Amnicola Highway. "Shock, anger, confusion, frustration," he said. "It makes you sad because it's not supposed to happen here in your backyard." In the recruiting center, the offices for the Air Force and the Marines were open, while the Navy's office remained closed, broken glass still strewn inside. The Army's office was locked and empty Wednesday. The National Guard's office was empty, as well — Tennessee Gov. 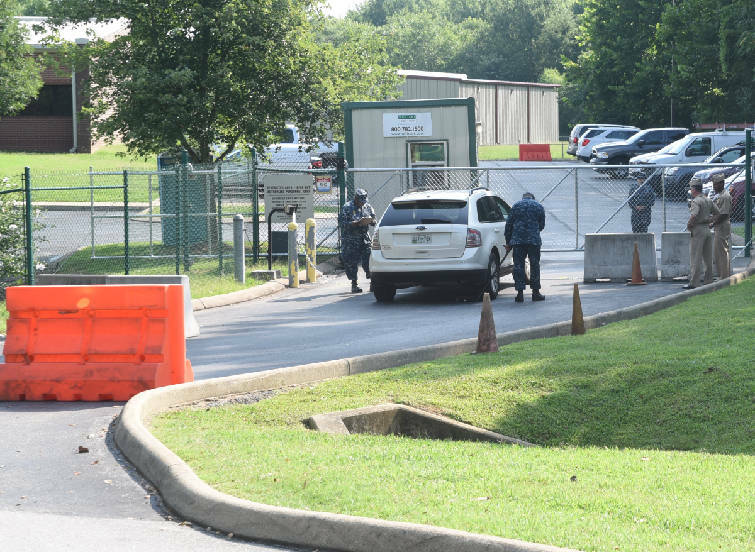 Bill Haslam ordered the state's National Guard storefront centers to temporarily relocate into armories six days after the shooting. Across the parking lot from the new flag, Keith Bobo set up a metal folding chair near the doors to the recruiting offices and strummed patriotic tunes on his guitar for about an hour around noon. "It's for the recruits coming in," he said. "To encourage them." Although, he said, he hadn't seen any recruits yet. Contact staff reporter Shelly Bradbury at sbradbury@timesfreepress.com or 423-757-6525 with tips or story ideas.